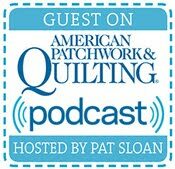 I have to try this pattern - love those mini 9 patches. Your pillow is so cute! It looks like a fantastic book with lots of scrap busting ideas! LOVE your cushion, with its pretty pom-pom finish! My scrap busting hint- don't let them get out of control! Erin, I love your pillow. What an awesome way to use the smallest scraps! Thank you for the chance to win this book. Your pillow turned out just darling. I have really been inspired by Sunday Morning Quilts and have started organizing my fabrics by their inspiration. I even made the fabric boxes! When I saw this book, I kept telling myself that I didn't need another book, but all of these darling quilts in the blog hop make me want to have this book as well. I think I need it! I have a lot of scraps and could put this book to good use! Love the pillow and thanks for a chance to win! I love hearing about scrap organization. I keep 2"squares in a box and strings in another. And then everything else in another box that I try to keep tidy... just trying!! Your pillow is so reminding me of a sweet dessert. The scrappy back is precious too and I know you made Amanda Jean proud..your daughter will love it for a long time. I've been knitting my skinny strips and selvages into rugs..another Crazy Mom QUilts tutorial. Thank you. wow those are small pieces. I am sure I have thrown out way too many scraps that small. I am not very organized but I like clear containers so I can easily see things. Love the pom poms. This pattern is so cute but I don't have the patience for those small pieces. Love that pillow!! What a cute pillow - it is so springy!! Her book looks so fun! What a darling pillow! I think that 9-patch quilt might be my fav! Thema pillows are really amazing! Have a wonderful Friday to you.. The pom pom are the cutest...and the back! I try to keep my scraps organized by cutting the pieces into 2", 2.5" and 5" blocks when a project is completed. I have a basket on my cutting table that gets all the selvages and and one that right now is receiving tiny scraps for Bright Birch Trees. That being said, I have lots of fabric that need to be tackled and tamed. It's an ongong process. So cute! And those squares finish at a 1/2"?! 😍 I have no scrap organization at all. They just all live in a few big tubs. I really need to do something about that! I really need this book! Those mini patches are adorable! So cute! Cute pillow. The pompom trim is adorable. Where did you get your fabrics??? I am total sucker for 1930's prints. I sort by color in large ziplock bags. Beautiful pillow! I am in desperate need of scrap busting and organizing help! This has got to be the most adorable pillow I've ever seen! I cannot wait to get my hands on this book! Not only do I favor the colors in this patchwork beauty but the little pom pom trim does the pillow justice! Thanks! Your pillow is so inspiring, I love it! I don't any great ideas for scrap organization--guess I need the book! Your mini nines are so adorable, and they are perfect for that pillow! I organize my scraps by color into plastic tubs, which are really full right now! Thanks for the great giveaway! Your pillow is so beautiful! The pompom-border is a Great wow-factor. I love your pillow and I think that would have to be my first project from this book. Thanks for the chance to win a copy, from everything I've seen its a terrific book. this is too darn cute. it's worth rounding up my itty bitty pieces and making one similar to this. loved it and would love to read this book. I love your pillow! The pom pom trim is the perfect finishing touch. Your pillow is darling with the pom-pom trim. I am constantly reorganizing my scraps, too. I sew rows and rows of scraps together in 3 inch wide strips (easy trimmed to 2.5) of foundation paper or very light weight interfacing. I just keep adding more strips end to end and keep them wrapped around an empty fabric bolt. I have miles of this stuff sometimes and then I trim to 2.5 and giddy up go just like a jelly row quilt but all scrappy. Wow the Block is so small 1/2 inch...? I organize by color, as I've found that I'm much more likely to use my scraps if I can go to a container of blue scraps when I'm working on a project and need some blue, than if I need to dig through a huge basket of scraps looking for a few blue scraps amidst the many. But I do keep a separate special box in which I put scraps of fabric from each quilt I make. I've already made one log cabin, incorporating these types of scraps, and it's a treasure, filled with tender memories. Now as I tuck away the "new" scraps, I'm getting ready for whatever the next "special scrap" quilt will be. I love those little squares! What a cute pillow! I am still in the scrap organizing stage. Right now cutting up my scrap stash that was organized by color and in bags but this process quickly got out of hand after the sorting by colors. I simply have too many scraps and need some project mojo. Thinking this new book will provide that. So new organizing is in the works by 2 1/2" 3 1/2" and 5" and then 1 1/2" strips. And then a few left overs will go back in the scrap pile to sew together as a quilt top someday. Erin! Your pillow is absolutely adorable. I love that you made it two sided! That made me smile. The pom pom trim is a wonderful addition to the project. You always do such beautiful work! Thank you so much for being a part of this. I sure appreciate it! The Pom-Pom fringe on your pillow is the perfect finish! I think I will be making the mini four patch quilt. It will be a nice one to work on over a long period of time. Love Amanda Jeans first book and know this one will be great too! I love your pillow! It is just beautiful! That pattern is so cute. I might have to try it. I had some experience working with small patches when I did the 365 block challenge. Hi! I sort my scraps mostly by color in plastic shoebox-size containers. I have quite a few containers! I love your pillow! It's crazy how many of those blocks it takes just to make something that size. But they are so very cute! I really like that you pieced both sides of your pillow. I can't decide which side I like better! My scraps are mostly organized by size. It's time to give away all the scraps I no longer love, there isn't enough time to make the unloved scraps into projects, too. No tips on organizing, need help. Love the pillow. Your pillow is so cute! I don't think I'd ever have the patience to work quite that small. Love your pillows. So adorable. Cute pillow! Love using up my scraps! This looks like a great book! I am only organized enough to have my scraps sorted by color in clear tubs. I love your tiny square blocks and am going to have to try some! You can never go wrong with a 9-patch - in any way, shape or form! LOL I usually cut my scraps into strips and store them in baskets. 1", 1-1/2", 2", and 3". Works for me! Your pillow is so cute!! I really like the pom pom trim. I use plastic shoe boxes for bigger scraps by color. I have two big Ikea boxes that have random scraps and a large plastic box that I have been shoving scraps in for the last year. I really have way too many scraps. Love your pillow. No organization going on here- only wild, reckless abandon! I think I would struggle with such small pieces! Looks awesome though.. I cut my larger scrap pieces left over from projects into squares and keep them in a tote. I have pizza boxes for different sized strips. Random strips are kept in another box by my sewing machine and I use them when making different scrap blocks. It seems to grow instead of decreasing! Thanks for the opportunity. I love your pillow. I love the way your pillow turned out! Thanks for the links to everyone on the tour; my blog reading list just grew! I am a new quilter with 7 finished quilts and not so many scrappy (1 box till now), my best tip is using them quickly. So I try to put them into the backing. Thats always nice, as it can be another story as the front and is much more hidden. But it is there. Obviously hidden. Love that. For my "50Shades of Green Quilt", the back used so many scars just to prove", that is were 50 different shades of green! Scrapbursting. Love this pillow, so adorable! Love the mini-nine patch block! So cute! I organize my scraps by color and size in plastic containers. I think this pattern is adorable and would work fine in almost any size. However, the mini is pretty sweet. I keep fat quarters and yardage separate, and then sort my scraps by colour, unless they are precaution. Then they go into strips or squares containers by size. Glad to have met you and checked out your blog. Just a hi! I'm too new to quilting to have much of a system yet, but getting there! I'm still working on a good scrap organizing system! I love your pillow-the fringe took it toover-the-top cute! Such a pretty pillow! I've just sorted scraps from my last project and am now trying to decide what to work on next. I am in England and so hope to win a digital version of this book. I love your mini Nines in pillow form, and such bright fresh colours! What a lovely pillow you have made with those tiny little scraps. Beautiful pillow! 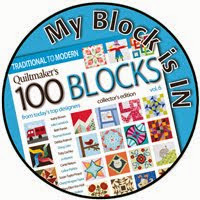 I have the book, but would love to win another copy for our quilt guild library! Lovely pillow ! Thank you for the giveaway ! All of your scraps are beautiful together--inspiring to me to get some out and DONE! Love your pillow! Love those tiny pieces. I try really hard to cut up my scraps as I generate them. I sort by size instead of color. 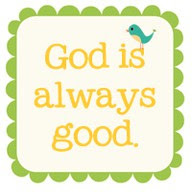 Since I do a lot of scrappy things, that works for me! The pillow is so sweet and the pompom trip too cute. My organization tip is to use covered storage that is opaque, especially if you have a sunny sewing room, to protect from light fading and dust. Your mini 9 patch pillow really cute. I think nine patches find their way into every one of my quilts...I just love them! Such a lovely cushion. I'm a fan of Amanda Jean, too, and would love to have her book. I sew scrap quilts all the time, and organize my scraps in plastic bags, coulour by coulour. Thanks for the giveaway. I would so love to win this book--there are several projects in it I'd love to make! I love your pillow that you made - the fabrics are so happy. I'm sure your daughter is very happy with it. 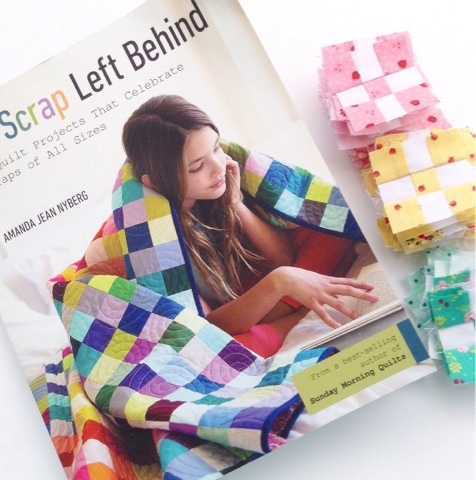 I really don't have any wonderful tips for storing scraps so I really need to win this book so I can learn. Plus, I want to learn how to work with tiny bits accurately. Thanks for the opportunity to win. Enjoy your weekend. Great use of scraps. I found your site on another site I look at all the time. Now you are on my favorites. I have lots of scraps and am trying hard to use them up, I love scrappy quilts. Your book would be wonderful to have. What a great book! I sort my scraps as best I can, and then things run amok-hahahaha! But when I'm making a true scrap quilt, it's so much fun to use up every last little piece! Beautiful pillow. I do the same as you and put my scraps in a basket on my sewing table which, in theory, is supposed to be sorted into my clear plastic bins when it is full. Sometimes it overflows a bit ! Yes!... That block would make a wonderful larger, long-term project! Your pillow is oh-so-sweet. I love the colors you used for it. They look awesome together. Thanks for participating in the blog hop and for offering Amanda Jean's book as a giveaway. I love the pillow. I really like the mini 9 patch blocks.. just not sure if I could do an entire quilt. ha! Hi from Kentucky and I love the pillow and trim. Seeing all those tiny scrappy pieces in your pillow makes me want to make one too. Sweet! What a sweet pillow! Really enjoying this week of scrap-o-licious. No scrap tips! I don't keep mine. Thanks for a chance to win. I love the fabrics you used! My tip is to cut your scraps into usable pieces and use them as leaders and Enders soon you'll have a while quilt! Such a pretty pillow. Your daughter must love it. I just love that colorful pillow! I am the person at classes and retreats that people give their scraps to. I like tiny paper piecing projects. Most of those scraps are in ziplock baggies so I need to get an organization system. I love your pillow! What a great way to use those tiny scraps. I am terrible about scrap management and need to get better about it. As my scraps are a mess, I won't offer any advice. I do love your mini nine patch pillow. It's so cute. Thanks for sharing and thanks for the opportunity to win Amanda Jean's book. Love the pompom fringe! I always look at it in the fabric store, but never buy any because I'm not sure what I would do with it. Hi from Montreal and have a great day. BEAUTIFUL pillow! Looks like a fun book! scraps are my jam! I don't precut anything in to strips or squares or whatever because I want the irregular pieces to be what I need them to be for a current project. I use large zip bags for most irregular shaped scraps, pressed and stacked according to general size. Strips are likewise stored with strips of general like width so hopefully I don't have to press scraps again. Hard sided plastic totes are the strips home. I sort my small scraps into fabric "baskets" I made in a rainbow of colors. Leftover strips are sorted into plastic drawers (organized by strip widths, 1" to 6".) Larger scraps go in one of two big baskets under my sewing table. Thanks for offering a chance to win!! I am totally loving this pillow! With the mini 9 patches and the pom pom trim, who wouldn't adore it? I have no system for scrap keeping besides keeping them all in one big basket. I like to think they enjoy hanging out together and choosing new color combinations when my hand mixes them up. Cute pillow! 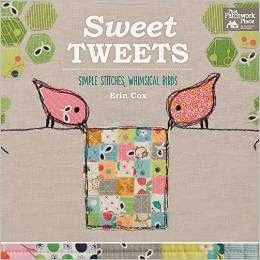 Loving the quilts from this book! I love my scraps! Thanks for the chance to win! Love, love, love your pillow!! So cute and a fine way to use up those tiny scraps. Thanks! That pillow is the cutest! I think I could make that many of the tiny 9-patches! The quilt in the post before this one is so lovely...think I must look at some more of your quilts and things...really like the way you use color! Love the little nine patches pillow. Great idea to make a project that can be finished quickly. I mostly sort scraps by colour, but confess I don't have the patience to deal with little tiny scraps and after filling boxes and bags with them over the years, I have to confess that I have just started throwing out anything smaller than a fat eighth. Got too overwhelming! Wow! Great pillow. That is a fantastic way to use the very littlest of scraps. I don't really have any great tips since I don't really have much space for storing them. I keep all my scraps in one drawer. This blog hip is making me rethink my system, though! Darling pillow! Thanks for the chance to win! The Mini Nine is an awesome quilt and I see it makes an awesome pillow also. I love Amanda's scrap projects. I have plenty of scraps waiting to be made into something cool. I am the one that needs help with my scraps! Your mini four patch pieces are scrumptious! The only tip I have is I try to use them all up once a year before they can multiply. They have babies you know. Like rabbits, I think. The colors you chose for this pillow are wonderful, and the tiny ball trim is the icing! My wife has plenty of scraps. Some she has cut into squares or half squares, depending on the size of the left-over scrap. She sorted them into plastic bags, and they are stored in a huge muck bucket. I tend to take my scraps and put them into stacks and tie them together with a piece of string-fabric. My wife refers to them as "pellets". They are stores in our fabric closet. My wife is much more prolific than I am, so my scraps are few. I love this mini nine patch, and I think I will have to make something like it, whether or not I am using tiny scraps!!! Thank you for the opportunity to win. I'm the one who needs tips. Loving all of this thank you. I adore your pillow!! You have the prettiest scraps!! I cut my scraps or left overs into sizes of strips I use a lot, that can be cut done further for future projects. If not enough for a strip, I cut them into various size squares, odd size pieces go in the crumb bin or string bin. I have a laundry basket under my cutting table, and will toss larger scraps or leftovers in there to be cut down later. My granddaughters love it, they know anything in there is fair game for them to play with. I also draw on this for applique pieces. I have no scrap management hints - mine have a life of their own! Cute 9 patch pillow! I cut down all my scraps. If I have over 12" then I make a strip. Anything smaller gets cut into squares. I love the bright cheery colors of your pillow and the pom-poms push it over the top. I am getting to love small piecing. It looks nicely neat. The pillow is so cute! I love scrappy projects. I love to make rag rugs with my scraps! I have no tips for storing scraps. Mine are a mess. Your blog is beautiful. I love your mini nine patch pillows. I am currently making mini stars with some of my tiniest scraps. I have yet to find a good way to tame my scraps. Amanda Jean's book might help me use them up and then I won't have to worry about storing them! I love your pillow. I organize my scraps by size but I am starting to think about doing them by color. Love your adorable pillow! The ball fringe is so cute! So many wonderful projects in the book! Thank you for the opportunity to win! That pillow is so cute . Thank you for sharing . Your pillow is amazing! I love working with scraps, and I organize them by color. I too love scrap blocks and now have an Accuquilt to cut up my scraps into useable pieces so I will use them up. I'm always looking for new patterns and ideas and this book would be perfect. Your bordered 9 patch is sooo cute. I cut scraps into squares, various sizes and store them by size that way I don't have wrinkled messes of fabric like I used too. Of course I could have just kept the scraps folded but that didn't work for me. Love the vintage summer look of your pillow and the pom pom trim matches/coordinates beautifully. Great project!! My scraps are only beginning to get organized so all these tips are certainly helpful. Currently I have them divided into strips, chunks and smallish. Need a better system. I share my sewing space with my decorative painting space so tidy is good! Would love to have the book..the more I see the more I "Need" it! oh my goodness, I love this pillow. This book is going on my Christmas List in case I don't win. Beautiful pillow for your little girl. My tip is my fat quarters are organized by color in those collapsible bins that come in different colors and the little scraps are organized by color in smaller plastic bins. That is just the nicest pillow ever! Sweet. Love this pillow! Scrap quilts are becoming my favorite quilts to make. Thanks for the inspirations!! Thanks for sharing, these mini nines are delightful to my eye. I keep my fabric strings over pant hangers, the tacky cardboard from the dry cleaners is a plus. Wow -- your pillow is adorable! I love the combination of the pattern and the sweet prints. Thank you for offering this book giveaway! What a sweet pillow. Love the pom pom too. Great scrap management tips in all these comments. 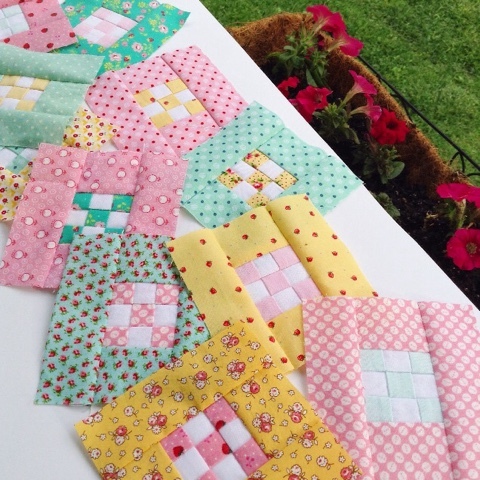 As a new quilter there is a possibility of getting a handle on the increasing accumulation, not to mention ways to use them- thanks Amanda Jean. What a pretty pillow - love the added pompom edging! I like to cut up my scraps along the way of my projects. 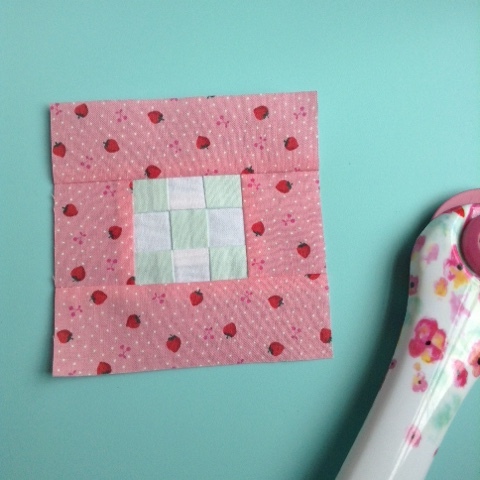 My littlest scraps are 1.5 squares though sometimes I still do keep 1" squares :)! Then I keep a basket each of 1.5 - 2 - 2.5 strips. I also have baskets for 3.5 to 7.5 scraps - but these are only cut when it is the last little piece of that fabric. This has worked well for me - especially when making my scrappy log cabin blocks. Each January I try to tackle my scrap baskets and make a few scrappy quilts. Amanda Jean is a queen of beautiful quilts - scrappy or otherwise - always love to see her projects. I am amazed at how small those blocks are. Beautiful in your pillow. I like the idea of a basket by sewing are to put scraps of current project in. Your pillow is so sweet! I like the colors you chose. Like a lot of others (and I confess I was GLAD to see there are a lot of others...hee hee! ), I don't have a good organizational method for my scraps. It was a huge mess, then I started Bonnie Hunter ways, but still like my color sorted boxes too. I cannot seem to find what works best for me. I also need help organizing my patterns too. I love the way you have put your colours together. The white background allows the brightness of the colours to stand out beautifully. What a good idea to have a bucket beside you to put scraps in. I also have some teeny little scraps that could be guided by Amanda Jean's clever book. Thank you so much for the inspiration. I love your pillows. I have a hard time parting with any of my scraps. There is always a new project around the corner. Thanks for the opportunity to win the fabulous book. Love the pillow! Scrap quilting is my favorite! Would love to win this book! Thanks for the chance. Adorable pillow. I try to keep scraps sorted by color in plastic bins, but I hadn't thought of sorting them within the bins by size/shape. Thanks for the tip. What scrap organization? After reading these ideas I realize I'm really not organized! Love, love, love the pillow! Need one. I store fabric stash by color but scraps are just tossed in a big tote. Not great but it works. Love these little blocks. I love your pillow. I keep scraps in plastic bins grouped by color. I love Amanda's scrap busting techniques. I keep my scraps in boxes by size. I try to cut scraps as I go. I love following Amanda Jean's blog and her wonderful scrap quilt ideas. The mini-nines look so cute in that pillow. Nicely done! I keep my scraps sorted by color in plastic bins. I have smaller bins for smaller scraps and larger bins for larger scraps. I am a semi-Bonnie Hunter scrap saver. That means I don't keep up and have several boxes that need cut into strips or squares. The pillow is adorable. My tip is to cut all yardage (after a project) into 2 1/2" strips. Makes it EZPZ to use up! Love that pillow!! i use plastic cases to store scraps divided by color and size. Your pillow is just gorgeous - "both" of them! How nice it is to be able to use both sides. I love the colors and those tiny nines are adorable. My only scrap tip would be to keep everything in see through containers. If I don't do that, they are lost forever. I follow Amanda Jeans' blog and have her material; would love to have her book. I wished I had some brilliant idea for scraps, but I do not!!! This is a super cute scrap project you made. Great photography too! Your pillow is so adorable!! I love using scraps and especially the tiny ones. Thank you for sharing your blog in the "BLog Hop" and offering the chance to win the book. It is so interesting to see others ideas. Love your adorable project. The colors are so sweet! Hi, your pillow is very sweet, your choice of colors Are perfect. Thank you or your organizing tips, at this point I am only semi organized for the scraps. Amandas book looks amazing! Thank you! I love the pillow!! I have never saved tiny scraps and probable throw out many pieces that most quilters with die to have SO I think I will try saving them for a while and using them. I've read about some that use them as leaders on the machine when sewing other things. Before you know it you've got a lot of "tinys" sewn up for a block. Your pillow is adorable. The pom poms are just the cutest finish. Great job. Although I try to keep my scraps in order, I'm always eager to hear new ideas. Thanks for the giveaway! Hi! Love the pillows! great idea. I have trouble organizing my scraps. It is overwhelming! Thanks for the chance to win Amanda's book. Your pillow inspires me to make a scrappy pillow! I think your pillow is so cute. My scraps get carried away sometimes. I do try to sort by color. My scrap sorting system keeps changing, too. Mainly because the scraps keep growing, especially the solids! Sweet pillow. Thanks for sharing your nine-patch pillow with us. It is adorable. This book looks fantastic. I don't have a system to contain my scraps but I am learning lots on this tour. I love your pillow! Such cheerful colors! I sort my scraps much like you do, with a basket for strips added in and a basket for selvedges because I think I may crochet a rug with them eventually (an idea from Amanda Jean). I also like to keep a few scraps by my sewing machine for testing stitches or using in between smaller pieces when strip piecing so my blocks don't get eaten my by machine. Sometimes a start a bin that has fabrics that go together for a certain theme, like springtime colors, or scraps for a kid's quilt.